Did you have to deflate it? Didn't it catch on the plastic lip? Did'nt have to deflate tyre,have to wriggle & jiggle a bit but slots in OK. I just had the wonderful experience of having to wait two hours for a relay back home when I burst my tyre...and whilst sitting there I vowed not to make the same mistake twice. I have a 2012 RCZ, with 19 inch alloys; I have been offered and 18 inch together with (not too badly worn) continental tyres. Does anyone know if that would work as a "get me home" option?? Thanks so much in anticipation. The rolling circumference would be the same. Or whether you would need to put the rear on the front so you can put the spare on the rear. I've purchased a Peugeot 407 Space saver on Ebay, 17in, for £5, although my wheels are 19in. members say it will be ok, my son gave me a scissor jack, sorted ! I bought a 13 plate RCZ THP/Sport/auto a few weeks back - covered 9k miles full service history etc, one owner. It's on 18 inch wheels and measurements are 235/45/18. I knew there was no spare tyre but worry about that as well does my dad just in case I had a puncture. I belong to a breakdown service so jack not required. I have ready through this long thread and others on the net but still a bit confused. 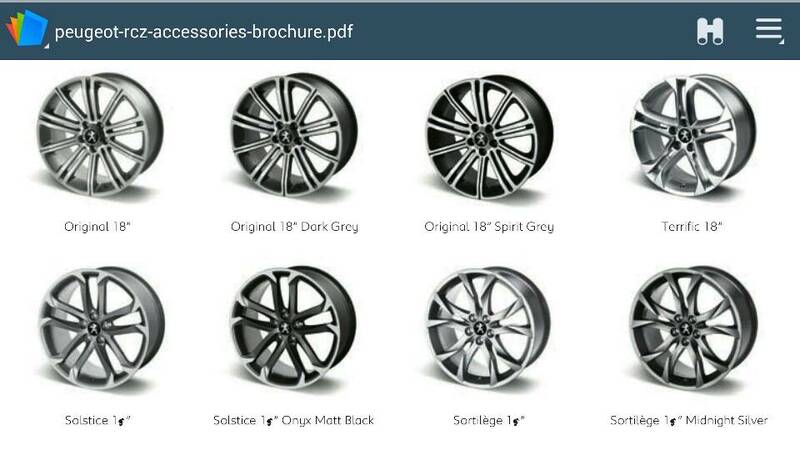 I guess I could by one from the main dealer rim and tyre but I think it will cost around 500-600 quid, cant do that. Will a full sized 18 inch tyre fit the space in the back once plastic tray is out? ps - tackling the pavement crossover at angle to avoid catching front, but risky, any tips please. A space saver has to be fitted to the rear as the front brake caliper is too big I think. Some have used a 407 spare wheel. Further research shows that the main dealer may do a tyre for 250, may call them on the weekend. My dad measured the space in the boot and feels it will fit but boot cover may not be exactly flush. What I want is a realitvely cheap space saver type tyre that can fit front and rear. The car is a standard RCZ sport automatic as far as I know. Still confused re "407" tryes as they ar 17 inches. RCZ based around the 308 according to web reports. Hi yes your dad is right the 18” wheel with tyre will fit but will stand up a bit proud all you need is a few pieces of sponge to even out the boot cover. Just get a can of emergency tyre foam stuff [ https://goo.gl/NeJcNv ] and keep that in the boot instead. It's cheaper, easier and a lot safer than trying to change one of these heavy and awkward wheels at the side of the road. All you need it to do is get you home or to a local garage and that'll do it just fine. It's the rolling circumference of the wheel and tyre that is needed. 19 is the diameter of the wheel to be fitted on. There are rolling circumference calculators on the Web for free that will let you know what size wheels you can go down to. The 407 space saver has the correct hole pitch for the RCZ's hub. It also has the clearance for the rear calipers, I believe. I don't have a spare wheel yet (still looking). You could possibly get one from a scrap yard and ask if it can be checked for fitment before purchase. Thanks to all for trying to help me. Looking on ebay everyday, nothing. Any other options please that will fit in the tyre hole in the boot? It is not a problem we are here to help where we can. 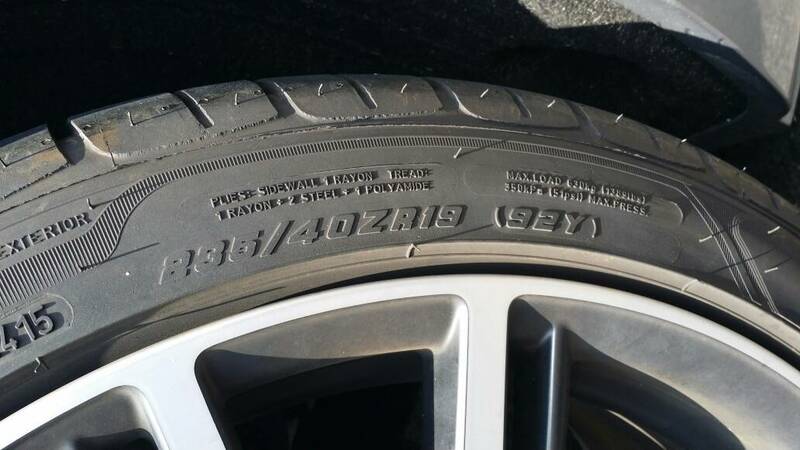 Have a look at your tyres it will state the size on there. This is an example of my tyre size. It's the R19 part that gives the wheel diameter. This is 19 inch diameter. You can also search ebay for RCZ's that are being broken from a scrap yard as they can sell you just a wheel or just a bolt. Please remember that there is no such thing as a daft question, if you don't know! This may help with the name of your wheels. The squiggles are 19 inch one! They have the whole car and are wanting to sell each bit. So a bit of trial and error to see if they have the parts you need! Thanks you all. 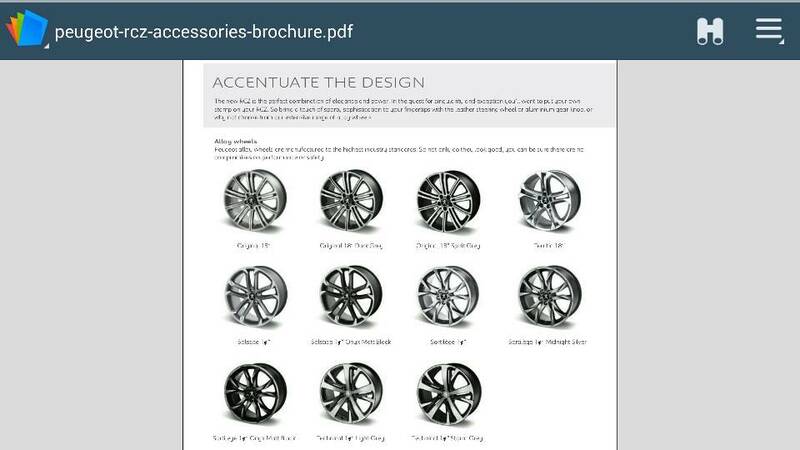 Been considering buying a brand new cheap alloy and tyre and my tyre size is 235 45 18 and car is a facelifted sport. automatic. I think my dad said buy a new alloy for about 60 quid and tyre for about 60 all fitted, will research more next few days. Had a wheelie good weekend! And I now have a full size spare. Eases my mind a lot. I bought 2 tyres a few weeks ago and the tyre man said he could find me a wheel. They had to machine it a bit but I tested it today and it's fine. It fits in the hole in the boot -tight- and the jack etc sit in the middle. The cover sits flat, so a great result. The work on the wheel cost $200 and I used one of the old tyres, money well spent as a long distance tow would be hundreds. I also bought a spare coil after having a failure a few weeks ago. And Re. A post above: I cut the plastic lip back with a Stanley knife. The plastic is quite soft. 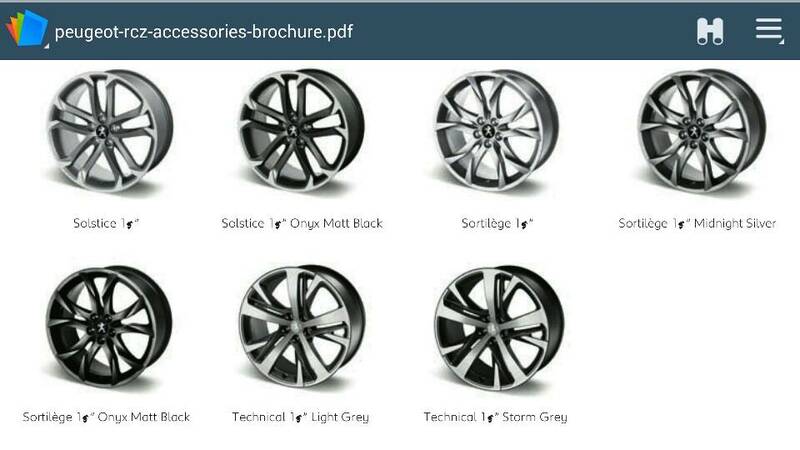 I have just purchased a spare 19" Sortilege rim with a continental tyre fitted, both in quite good condition. This came complete with jack and wheel brace and a polystyrene housing to fit in the centre of the wheel, all from e-bay for £250 plus carriage. The wheel fits in the space in the boot, left by removing the original polystyrene fitting that contained the useless rubber inflating kit without being deflated. The rim and tyre fit very slightly proud of the original fitment and so the boot floor has been raised by about 0.5". The problem I have now is that I can hear it bouncing and moving about as I corner and go over larger bumps. Can anyone recommend a fitment to go through the rim centre to screw it onto the base of the under boot space? I am not even sure what the part is called, any suggestions (polite only please).